Essential plot rundown: A man marries a widow in attempts to find the decease husband's buried money. I've been reviewing a lot of recent Hollywood blockbusters lately, so I thought I'd turn to a classic for my next watch. This was an interesting film. The basic premise is good but the overall movie was kind of a mess. The man is looking for a huge some of money and only the kids know where it is at. So the whole time the guy is trying to get the kids to tell him. It's kind of an uneasy feeling watching him go after the unprotected kids. But as a whole, the movie doesn't flow. The first 15 minutes were super choppy and I was a little confused. Then things get going, with the tension slowing building. Until the third act, that is, where it totally stops. The momentum comes to a complete halt and it kind of feels like a different movie. And the ending doesn't flow either. During the whole movie, there are little odd things that don't really fit (whether it's a scene or something a character says or does) that hinder it. Also, there is no indication of time, so I had no idea how much had been passing. The acting wasn't anything special. Sometimes it would cut to the boy's (played by Billy Chapin) face and he would look like he's not sure what he's suppose to do. (But then again, he's just a kid so you can't expect too much). 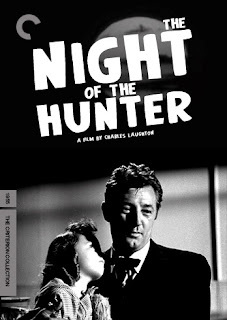 However, I did like Robert Mitchum, who was the antagonist; he played the role with a good level of intensity, thought, it did get too high sometimes. The best part of the film was the cinematography. 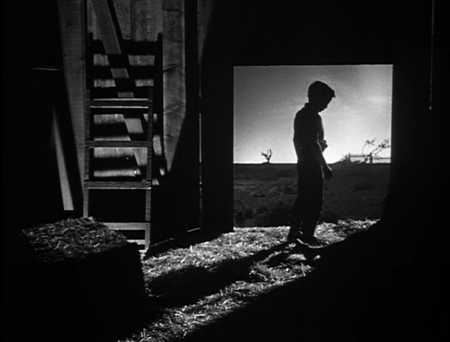 Stanley Cortez (DP) uses high contrast, creating a lot of deep, dark shadows. He then uses these to composite some pretty aesthetically pleasing shots. There are a lot of beautiful and haunting images here. So, overall, the film doesn't really flow very well. It's not bad, but it's definitely not the best made. But I would say it's worth checking out for the cinematography, if you're into that type of thing.